Currently we are taking a break from group classes. 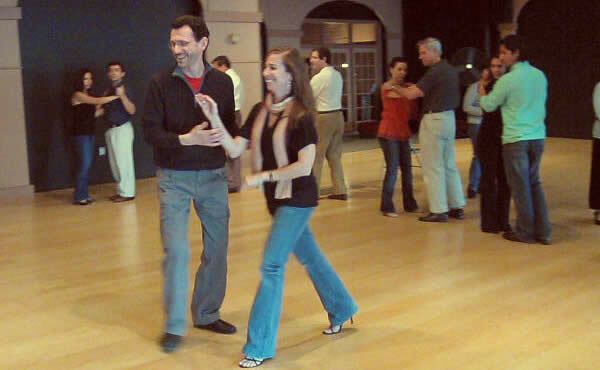 Please visit our Private Dance Lessons in Atlanta page and choose the best option for you. Chances are it could be a 6h/5 session block of time – to take advantage of the low rate, or, for even lower rate you could pick a Semi-Private option (just invite your friends). Ilya, Thanks so much for your introduction to Argentine Tango. It was fun to learn about the origins of the dance and music. You did a fantastic job helping us, who started from no prior experience, to learn and perform many new steps during our lesson. The time flew by. I would recommend this class to beginners everywhere. We may resume group classes at some point. Join our email list to stay current with news and announcements (in the left sidebar). You can join the course after it started – contact us first! Beginner Course by Tango Bohemia consists of 8 Argentine Tango classes. The goal is to teach students base Tango elements and introduce them to a core technique. The course enables everyone to start dancing Tango at parties (milongas). Classes are 75 min (including 15 min of practice time (Practica). We strive to create a sense of community among Tango dancers, make classes fun, present different styles of music. We want you to become comfortable with this wonderful dance which can be a lifelong activity, hobby, and passion. Argentine Tango is a dance for all ages, professions, persuasions, singles or couples. We recommend bringing a partner, although it is not a requirement. We rotate partners throughout the class, simulating a dance party environment. It improves your leading and following skills and helps with your learning process. If you decide to stay with the same partner you are welcome to do it by notifying me. We encourage you to arrive 10 -15 minutes early for your first session to register. It is also a good habit to come in a bit earlier for all classes if you can – so you can meet and make friends with other students before the class starts. Make an effort to attend group classes regularly. Good dancers become who they are because they regard their attendance as a wonderful commitment to themselves and pursue their goal with consistency. The Argentine Tango is an improvisational traveling dance. We teach students how to connect with a partner, how to follow the music, and how to lead and follow your partner. A class often starts with walking exercises; and you can practice this essential element in your spare time pretty much everywhere: at home, in the mall, or in the parking lot. All good tango dancers work on their walk. Other elements such as Ochos, La Cruzada (the cross), turns will come naturally after you master your tango walk. You will learn how to make turns, how to pause, how to navigate a crowded dance floor, how to identify and interpret various types of tango music, and finally how to create your own unique dancing style. Dress is casual. Shoes with leather or leather-like soles and low heels for ladies are preferred. Gents – heels can have rubber, ladies – no heels will work as well. Your toes should be safe, no sandals please, sneakers are discouraged as well. * Sometimes late registration is possible; please contact me for information on Tango Atlanta. Just because our Beginner Course consists of 8 weeks it does not mean that your Tango journey is over :) In fact, it is only the beginning of what might become your new lifelong adventure! You would want to join our Intermediate Tango Classes in Atlanta on same night and stay for the whole Evening of Tango. These classes continue to build your Argentine Tango experience by focusing on technique as it’s applied to new dance elements we learn as well as to the ones we know from the Beginner Course. We’ll be learning not only Tango, but also Tango Vals (Waltz) and Milonga (as a dance). Active and consistent attendance only empowers your dancing style. After completion all students are also welcome to attend multiple series of our Beginner classes to continue perfecting their dancing technique. Our Beginner Classes are beneficial for Intermediate Level dancers as well. Here you can focus on the Tango fundamentals without being distracted by thinking about steps and sequences. During the first hour Intermediate students work on their technique and musicality, while helping absolute beginners to get up to speed faster. I do hope that with enough of your excellent teaching Tom and I will look more like a couple of dancers rather than a couple of “klutzes” :) - S. & T. W.
I had a good time… I really like tango. The teacher is excellent. Thank you, Ilya - A.
I have been learning Tango with Ilya for a year and a half now… It has been a remarkable experience: both enjoyable and challenging at the same time. I took a chance at something so profoundly different that it changed me and for the best. I learn how to dance and listen to my own body. I notice things I did not notice before and I laugh more often. I met new friends, and I lost a lot of weight. Tango is a perfect solution: it is addictive, the more you practice dancing, the more you want to practice - K. V.
Thanks for the class …it was very interesting and I learned a lot - P. H.